Lake Elevation: 3591.80 – Water temperature: 70-74 F – Sporadic rain continues to fall over Lake Powell. The welcome moisture has maintained the lake level at essentially the same as it was last week. Today inflow from the Colorado River is greater than outflow from Glen Canyon Dam. Two more rainy days are forecast in the next 10 days with average air temperature in the mid 60s and evenings in the mid 40s. There is one downside to the recent stormy weather. The drop in barometric pressure has caused a drop in fishing success. Anglers who were catching fish every cast a week ago are now struggling to find and catch fish. The good news is that the storms are clearing, pressure is rising and fishing success will perk up again. The secret to finding fish now – Particularly striped bass – is to go out early in the morning. 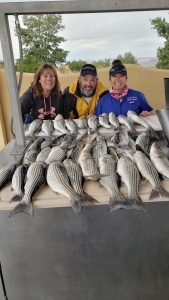 In the southern lake, stripers are being caught quickly on spoons from first light to 8 AM. After the sun gets higher and boat traffic picks up stripers are hard to find. Mid-day they can be found with anchovy bait used in the commonly reported spots reported here. If one favorite spot does not produce, then move to another to see where the schools are now. It should only take moving to 3 or 4 good bait fishing spots to locate an active school. Striper schools are suspending and feeding on shad schools half way back in major canyons. They are not easy to see on the graph since they are high in the water column while the graph is focused on the bottom in 50-100 feet of water. The most consistent way to locate suspended stripers is to start near the back of a major canyon and troll out towards the mouth of the canyon. It is best to use a deep diving lure, such as a Norman Little N or Deep Little N in Lavender shad color. Troll until a striper is caught, then fish with spoons and cast crankbaits to catch more fish following the hooked school mate. This technique should work lakewide. Smallmouth bass fishing remains steady. There has been a recent decline in total numbers caught with the same reaction to falling barometric pressure, but smallmouth are caught throughout the day. Smallmouth are holding in relative deeper water – not in the backs of canyons. Look for visible open water reefs surrounded by deep water. They were also found on deep cliff walls, in the shade at 15-30 feet. They are feeding on crayfish so use green colored grubs senkos and dropshot lures. Walleye are caught periodically while trolling for stripers or dragging a bass bait along the bottom. Walleye are not schooling fish, but they do tend to aggregate in the same location. It is wise to turn around and try to retrace the path where the first fish was caught to see if another walleye can be caught at the same spot using the same technique. Finally, the water temperature will soon drop into the 60’s which is the prime temperature for fish activity in Lake Powell. Catching should improve and peak during the next few weeks of October.